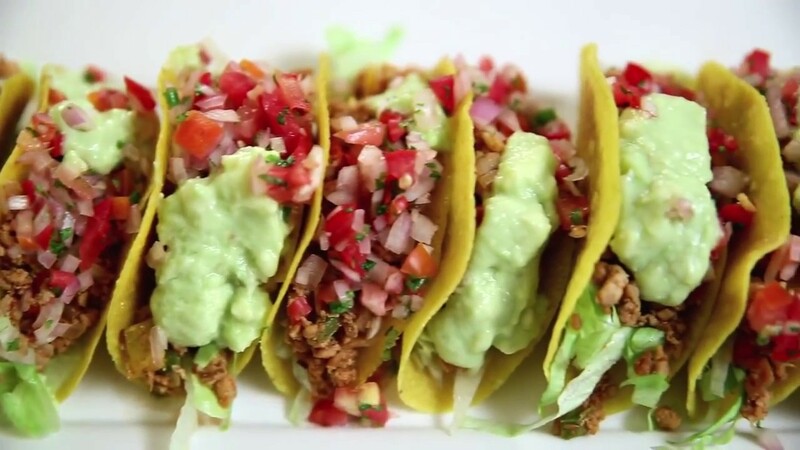 Learn how to make Chicken Mexican Tacos at home with chef Varun Inamdar only on Get Curried. A taco is a traditional Mexican dish composed of a corn or wheat tortilla folded or rolled around a filling.With yummy chicken filling and salsa sauce enjoy the mexican tacos made by chef Varun Inamdar only on Get Curried. Ingredients 1/2 cup onion chopped 1 no. red pepper chopped 1 no. green pepper chopped 2 tbsp olive oil 2 cloves garlic smashed. 1 tsp paprika powder 1 tbsp tsp cumin powder 500 gms chicken mince 12 corn taco shells Salsa 1 large tomato 1 medium onion 2 tbsp fresh parsely 2-3 green chillies 1 tsp tabassco 1/2 lemon (juice) Salt Guacamole 1 ripe avocados ½ lime Salt as required 2 tbsp fresh cream Method - Chop the veggies - In a pan heat some olive oil and then add the veggies and saute them - Add minced chicken and cook it on a high flame - Add salt, paprika and roasted cumin powder - Roughly chop the garlic and add it into the pan and stir it properly - Once the chicken is cooked properly turn off the flame and keep it aside to cool - Chop onion,green chillies and tomato and mix them together - Also chop some parsley, salt and juice of lemon mix it and add tabasco - In a bowl add the avocado, salt, cream and juice of lemon - Whisk it all together - Shred the lettuce leaves - In a taco shell put lettuce leaves, chicken filling, salsa and guacamole - Chicken Mexican Taco is ready to be served.